Rested after a two-week layoff, the Seattle Sounders begin the first leg of the Western Conference finals Tuesday evening in Houston. The Seattle Sounders begin the Western Conference finals Tuesday. After a two-week break for international play, the Seattle Sounders take on the Houston Dynamo in a two-leg series for a shot at a second consecutive MLS Cup. 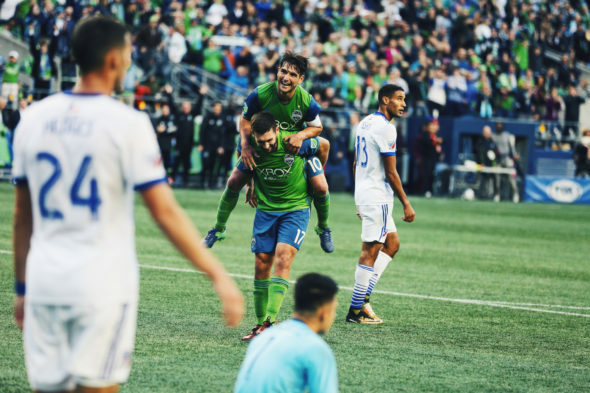 After defeating Cascadia rival Vancouver 2-0 in aggregate in the semifinals, the Sounders play the first match against the Dynamo in Houston at 6:30 p.m. Tuesday (FS1). During the two-week break, three Sounders were called away on international duty. Nicolas Lodeiro went to play in a pair of friendlies for Uruguay, while left back Nohou made his on-field debut for Cameroon. Significantly, Gustav Svensson was called in by Sweden and played 71 minutes in a crucial second-leg match that saw his country qualify for the World Cup finals over Italy. The added rest may benefit Osvaldo Alonso, who has not started since Sept. 27, when he strained his right quad. Jordan Morris, listed as questionable with a right hamstring strain, has not played since Sept. 10. Head coach Brian Schmetzer offered no update on either player’s return, stating only that they would play when they were healthy. In the meantime, the Sounders will look for Lodeiro, Clint Dempsey and Will Bruin to turn in star efforts. The trio, which scored 30 goals in the regular season, will be squaring off against three Hondurans, Romell Quioto, Boniek Garcia, and Alberth Elis, who recently failed to help their national team to the World Cup after an elimination series against Australia. The Sounders have never won a match in Houston at any phase of the season, but the cooler autumn temperatures, predicted to be in the mid-70s, may help Seattle overcome the sluggish starts they are known for in Texas. A first-road win in Houston or an away goal will do a world of good for Seattle before the return leg Nov. 30 (7:30 p.m., ESPN) and a second consecutive MLS Cup.